Suitable for courses about business/project development or business start-ups or specific project development in the course. The canvas can be used as a management and documentation tool for student work and reflects a non-linear process in the course. Business Model Canvas is a tool for working with the development of a business model, company or project. The business Model Canvas template consists of a number of steps, or building blocks, that are mutually dependent and influencing each other. The template does not reflect a linear process, but it encourages the students to work with the different elements continually in an iterative process. It is an important point, when working with the Business Model Canvas, that all choices and changes are influencing the remaining building blocks. You can use Business Model Canvas in your course as a reoccurring tool in which experiences, research results and data are documented. In that way the Business Model Canvas provides structure and ensures progress in the students’ project work. 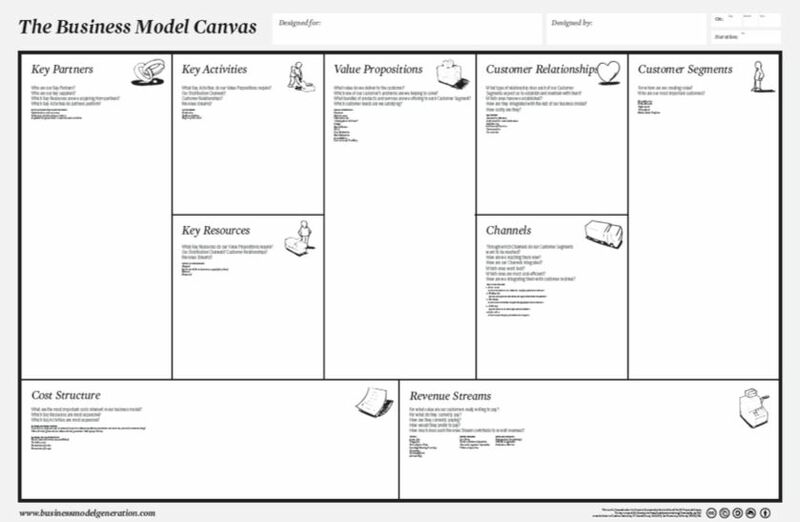 Business Model Canvas is also described as a method, find the method description here. It is a precondition that you already have a concept for a company, project or similar, that you want to develop a business model for. A good starting point is to begin with costumer segments and costumer value and afterwards go through each building block and the related questions. Below this section you will find a list of all the building blocks, put into logical order. However, you are not required to follow the list in a strict manner. As an introductory exercise you could use a well-known company, project or similar as an example and fill in each building block in dialogue with the students. Afterwards the students, in groups, should fill out the building blocks for their own projects. Afterwards the students present their business model to each other and give / receive feedback. Read about the individual building blocks in the Phases section, but remember that working with Business Model Canvas is not a linear process. Value Proposition – What are you selling? The products and services a company offers in order to fulfil the costumers’ needs. In this step you need to find the core of your product’s value. A concept, project or business exists by selling something, often a product or a service. Value proposition means that emphasis should be on what you are doing for the costumer, and not on what characteristics, functions or activities are built into the product. This is the difference between an idea and a business idea. You may use the methods below in order to find out what your business or project actually does and/or changes for the costumer. Costumer segments – Who are buying your services? In order to build an efficient business model you need to identify who your costumers are. In this step you need to examine and document the characteristics of the costumers you would like to satisfy with your product. Only few provide a product or service that matches everyone’s needs. Costumer segments clarify the most enthusiastic, susceptible group of costumers that also receive most value from the product. The costumers have to have a recognized or unrecognized need (cf. the building block Value Proposition). Partners – Which companies do you cooperate with? Which partnerships are beneficial to be a part of? In this step you need to map out which partners and suppliers should be connected to your company and agreeing on a binding partnership. Typically a partnership will involve a company that you are cooperating with regarding marketing, product development, purchases and so on, or perhaps the company provides rooms and equipment under favourable terms. Activities – What does your company do? Describe the most important key activities you need to complete in order to create value for your costumers. In this step you need to look inside your business and identify your core services. The primary question is: What tasks/activities do you need to solve in order for your business to function? This might seem obvious, but Arla, Netto and farm shops are all businesses with the same core service: to sell milk. Their core activities vary however, as respectively industrial production, logistics, store management as well as cattle farming and milking the cows. The activities that need to be mapped out in this step are thus the primary tasks that your business needs to master. As such this also involves considering which tasks it would be beneficial to buy other people’s workforce to solve. Resources – What does your company consist of? The resources that are necessary to create value for your costumers. Immaterial resources such as know-how, patents and so on. Customer relationship – How is your relationship with the costumers? In order to insure your company’s survival and success you need to identify the kind of relationship you wish to create with your costumers. In this step you need to concern yourself with your users and document which relationships you wish to establish with your costumers. How are you serving your costumers? Is it for example through personal service, self-service or automatic online service? How is the relationship supposed to develop over time? Are your costumers primarily one time users or does your company have long term costumer relations, that it may even be possible to develop further over time? The first many steps have been centred on the costumers and often these analyses will provide data for more stepping-stones. As mentioned, Business Model Canvas is not supposed to be a linear process. Channels – How do you reach your costumers? Specify which distribution and communication channels you need in order to reach the costumers. In this step you need to identify which channels are available and which you wish to use in order to reach a specific user. It would be beneficial to examine your costumers’ media habits as well as their geographic location. In what way are your costumers supposed to find your product? Do you sell it directly and personally? Do you use intermediaries, online shops and so on? Where is it possible to find more information of your product? Income – How are you making money? What income sources are possible? In this step you need to work on how your costumers are paying for your product or service. This might involve several different platforms and approaches. Do your costumers for example buy you product the traditional way or are you selling through subscription, leasing or as license? This exercise is often based on a market analysis. Advantages of economies of scale regarding growth or does this increase costs? To sum up, this provides an overview of what the costs are of creating and running a company – and as such whether it is an advantageous business or not.